Cancer immunotherapy in the news: What is PD-1? There has been a lot of buzz in the news lately after clinical trial results were presented at this year's American Society of Clinical Oncology. The drugs, Pembrolizumab and Nivolumab, were both found to reduce tumors in some advanced melanoma patients by blocking PD-1. 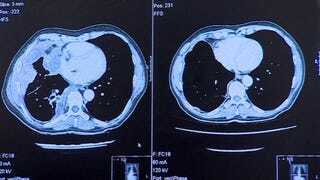 For those particular patients, the results are pretty dramatic (see lung metastases before and after treatment, from the BBC article). So what exactly are these treatments? And how do they work? First, a little background in the immune system, and what it does in relation to cancer. White blood cells make up the main soldiers of the immune system, with all sorts of different cells with different functions. While they all have their important role in preventing and eliminating diseased cells, T cells are a particularly powerful arm of the immune system. Not only are there cytotoxic T cells, which directly kill cancer cells, there are also helper T cells, which can act to boost all the other immune cells. How do T cells recognize cancer cells, and know to kill them? All T cells have T cell receptors, which recognize specific targets called antigens. These antigens are presented by proteins called MHC, and can be found on the surface of all the cells in our body. When a T cell recognizes a tumor antigen on a tumor cell, then the T cells become activated and eliminate it. T cells, along with other immune cells, are constantly monitoring our body for these abnormal cells, and eliminating them before they can turn into cancers. Therefore, a key step in tumor development is in finding ways to avoid or shut down the immune system. One way tumors do this, is through taking advantage of the normal regulatory systems that control our immune system. When a T cell becomes activated, it also needs a stop signal in order to make sure we don't get over-activation. One way this is done through inhibitory receptors, such as PD-1. After activation, T cells increase the expression of PD-1 on their surface, allowing them to receive a shut down signal. Tumor cells have taken advantage of this system by expressing binding partners of PD-1, prematurely shutting down the T cells. Vastly simplified version of the T cell interaction with cancer from SmartPatients.com. My heart hurts at the lack of MHC. So how to the treatments work? Both treatments are monoclonal antibodies, hence the -mab portion of their name. Antibodies are powerful, Y-shaped proteins in our body which can recognize and bind all sorts of targets (antigens) found in our bodies. These two mAbs recognize and bind PD-1, preventing the tumor cells from binding it. Importantly, they do this without activating PD-1, allowing the T cell to stay active. This prevents the tumor inhibition of T cells, and they can go about their important task of killing cancer cells. Here is where I stress the limitations. Cancers have a whole stash of ways to avoid our immune system and grow. All the "cures" touted in the news target a specific way to counter tumors, but it won't matter if the cancers can switch methods and overcome the treatment. This is why treatments, including nivolumab in this trial, are often used in combination with other therapies. If you attack a cancer from multiple angles, there is less chance for it to avoid elimination. Still, there are grounds for caution. The results are mainly from small studies that lack control groups for comparison. The medicines work for only a minority of patients. And while some drugs are well tolerated, there can be severe side effects. That seems to be especially true when two immune-boosting drugs are used in combination, something that might be necessary to achieve maximum effectiveness. While I give serious side-eye to any news reports touting this as another cure, I am optimistic that this is a very powerful treatment that could help certain people. If we build up our arsenal enough, we can widen the number of people we can effectively "cure". Personal share time: Immune therapies are what got me passionate about immunology in the first place, and I hope that I can work in this field after the PhD. Fingers crossed that I can help add to that arsenal of cancer fighting tools one day!